The Cave Rescue Service was established within the framework of Hungarian Speleological Society in 1961. The official establishment gave a significant progress and we begun to develop our common equipment base. A few years later we lost the Hungarian Speleological Society for the Hungarian Red Cross because of a change in legal background. Joining to the speleo-education system we published the cavers’ safety regulations in 1983. 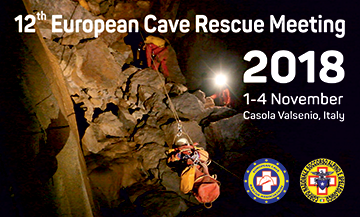 In the same year we had organized the 5th International Cave Rescue Conference in Aggtelek where 16 countries participated. In 1989 the 10th UIS Congress was held in Budapest and on that occasion the UIS Cave Rescue Commission held a symposium as a pre-congress event where 21 countries were represented. The legal background had changed again by the end of 1980’s and we left the Hungarian Red Cross and went under the authority of the Hungarian Nature Friend Federation as a member society. Our legal status changed into an independent society on the occasion of the political transition and our new name has been Hungarian Cave Rescue Service (HCRS) since 1991. As an independent organization we have created contracted cooperations with the Police, Ambulance, Civil Protection, Fire Service, Ministry for Environment Protection, Hungarian Speleological Society, and Hungarian Nature Friend Federation. Our target was to cover with our activity as large a part of our country as we can. Therefore we established two country branches: North Hungarian Branch of HCRS with its center at Aggtelek and South Hungarian Branch of HCRS with its center at Pecs. On the base of the experiences of some cross border rescue activities we have created close contacts and regular collaborations with Horská Záchranná Služba from Slovakia, Salvaspeo Corsa Romania and Salvamont Bihor also from Romania and Górskie Ochotnicze Pogotowie Ratunkowe from Poland. In 2007 we organized the 11th International Cave Rescue Conference in Aggtelek again. 26 countries participated. During the Conference an important document was born: the Aggtelek Agreement. The Hungarian Cave Rescue Service had celebrated its 50th anniversary of establishment in Pal-volgyi Cave at 29 April, 2011. Now the HCRS has more than 100 members who are all volunteers and we are able to do a cave rescue operation anywhere in our country independently of other organizations. Hungary is a rather small country compared with many other countries in the world. However, it is a diverse country, rich in cultural and natural sights. The Danube River divides Hungary to two quite different parts. The western part is called “Dunántúl” (Transdanubia) is mostly hilly land with the Lake Balaton in its center. The Transdanubian Mountain Range is located in its northern part and runs diagonally from the South-West to the North-East. The eastern part of Hungary consists of the North Hungarian Mountain Range and the Great Hungarian Plain called “Alföld” that is crossed by the Tisza River. Despite its size, there are a great deal of natural spectacles in Hungary. This description aims to offer a brief view about one segment of these: the caves. The Transdanubian Mountains are largely composed of dolomite and limestone. The most important karstic region of these mountain ranges are the Bakony Mountains situated north of the Lake Balaton as well as the Gerecse and Pilis Mountains near Budapest. All considerable caves of the Bakony are concentrated on the Tés Plateau near the city of Várpalota. The majority of them are vertical caves (Csengő Pothole, Jubileum Pothole, etc.). The deepest and longest cave of this area is the Alba Regia Cave that is not a pothole. There are numerous smaller caves in the Gerecse and Pilis Mountains visited frequently by cavers from Budapest. One can find some remarkable caves around the Lake Balaton in the Keszthelyi Mountains and in the Balaton Highland with the unique Tapolca Lake Cave among them, Cserszegtomaji-wellcave. The Mecsek and Villányi Mountains are minor karstic areas in Southern Transdanubia. The Mecsek Mountains rise above the historic city of Pécs, the one-time capital of the Roman province of Pannonia. The southern side of the Mecsek has a pleasant sub-Mediterranean climate and its vegetation is rich in Mediterranean and Balkan species. There are several stream caves and potholes in the Mecsek. The largest one of them is the Abaliget Cave. The Villányi Mountains is a famous wine-growing region. There are beautiful hydrothermal caves in this area, rich in unique crystal formations. Budapest is situated on the banks of the River Danube where the Great Plain meets the mountains. Pest, the bigger half of the city on the left bank is a plain area while Buda on the right bank is hilly terrain. Budapest is one of the world’s very few cities where more than 100 caves can be found within the municipal area. One can find these caves in the Buda Mountains situated on the right bank of the Danube, and they are mainly located under residential districts. The caves of Budapest are hydrothermal caves. In contrast with the simple plan of a stream cave these caves are labyrinthine networks of passages. Most of them have beautiful formations. The longest cave of Budapest is the Pálvölgyi Cave. The other major cave systems, the Mátyás-hegyi Cave, Ferenc-hegyi Cave, József-hegyi Cave and Szemlő-hegyi Cave are also considerable in length and beauty. The Bükk Mountains is the largest karstic region of Hungary with numerous stream caves and potholes. The largest, deepest and most spectacular caves of the Bükk are located on the Nagy-fennsík (Great Plateau), in the center of the Bükk, near the industrial city of Miskolc. The István-lápa Cave, deepest in Hungary, is the largest of them. Other large caves of the Bükk are the Bolhás-Jávorkút Cave System, the Fekete Cave, the Szepesi Cave, the Létrás Ponor Cave, the Diabáz Cave, the Jáspis Cave, the Kis-Kőhát Pothole, etc. In the North, on the Kis-fennsík (Small Plateau) one can find a large number of smaller caves. There are only two larger caves in the Southern Bükk, the Hajnóczy Cave and the Pénzpatak Ponor Cave. Caves are important archaeological sites. Paleo-archaeological research was initiated by O. Herman in the early 20th century in the caves of the Bükk. Well-known prehistoric sites are the Szeleta Cave and the Istállós-kő Cave. The Aggtelek Karst is located in the north-eastern corner of Hungary. It is a famous classical karstic region that became part of UNESCO’s “World Heritage List” in September of 1996. One can find the best-known Hungarian caves there. The greatest of them is the Baradla cave that is the longest in Hungary, and it used to be the longest known and surveyed cave system of the world for a long time, until the early decades of the 20th century. Other remarkable caves of the Aggtelek Karst are the Béke Cave (that is the largest fully explored perennial stream cave in Hungary), Vass Imre Cave, Kossuth Cave, Szabadság Cave. The Alsó-hegy Plateau is a unique part of the region with about 90 vertical caves (potholes). The deepest of them is the Vecsembükk Pothole. There are several caves on the Plateau other than potholes. The largest and most spectacular one of them is the Meteor Cave containing the second largest cave chamber of the country. The first Hungarian scientific cave descriptions were dated in the late 18th century. At the beginning the Baradla Cave of Aggtelek was the main subject of exploration. The first map of the Baradla Cave was made in 1794. In spite of the fact the cave was inhabited and fully discovered by prehistoric man, its larger part was unknown in the early 19th century, until 1825 when I. Vass reached the far end of the cave. After his discovery the Baradla Cave remained a subject of exploration for further 150 years. For example in 1934 H. Kessler got across the syphons of the Styx, the stream of the cave and found the passage to the Domica Cave that is in Slovakia. There are Neolithic finds such as soot and remains of fire places in the Baradla Cave even in the inner parts, many kilometers away from the entrance. Archaeologists disputed that people in the Neolithic Age had adequate lighting instruments that made reaching remote parts of the cave possible. In 1960 some cavers spent three days in the cave and walked all over its main passage using only tallow and resin torches of the same kind that Neolithic man had. Their torches were made according to the finds found in the cave. They proved that Neolithic man could move far away from the entrance of the cave and could spend a couple of days in the darkness. The first descent of Hungary’s deepest potholes on the Alsó-hegy Plateau was made in 1927. The rope ladders used were unfit for discovering the deeper parts of the Vecsembükk Pothole deepest on the Plateau. Only the entrance shaft of this pothole was known until 1969 when the lower shafts were discovered. Most of the hydrothermal caves in Budapest were discovered in the 1930s. The known lengths of these maze-type caves are increasing still year by year. E. g. the known length of the Pálvölgyi Cave was 1 km in 1980 and it is 12 km now. In the 1950s cave exploration in Hungary advanced rapidly. A large number of considerable caves were discovered, mostly on the Aggtelek Karst and in the Bükk. The Béke Cave of Jósvafő was discovered in 1952 and is the largest and most remarkable among them. The existence of this cave had been proved by water tracing before its exploration started. The appearance of single rope techniques (SRT) in the late 70s and early 80s stimulated the exploration of deeper caves, potholes and greater shaft-systems, such as the Szabópallag Pothole on the Alsó-hegy Plateau or the Fekete Cave in the Bükk Mountains, lasting so far.